I was making Chicken Sausage Gumbo for years before I began No Time 2 Cook. I actually learned to make it from my Papaw who learned from bayou boat captains in the swamps of South Louisiana. Papaw’s specialty was squirrel gumbo and except for the small bones, it was some of the best I ever ate. Through the years, the recipe evolved to chicken and sausage which we sold at our early farmers markets. Here are some tips I’ve learned through the years. Some you may want to try and some you may decide are too much trouble and time consuming. Every pot of gumbo is different and unique to the cook who makes it. When I make gumbo it’s a two day event and my weekend entertainment. If you are someone who wants to get it done as quickly as possible, use my time saver suggestions. I make no apologies for all the instructions below. If gumbo was straight forward, more people would make it. If you have never made gumbo, but would like to try, I encourage you to study the recipe carefully and decide a plan of action before you begin. Kary’s Roux, available in a jar at some grocery stores, works just fine if you want to save about 30 minutes in the gumbo process. If your grocery doesn’t have Kary’s, it can be purchased online at Amazon. If you want a darker roux, you can brown it a little more. Or, you can cook your roux from scratch. A roux is very easy but does take some time. Blend together your oil and flour in a skillet and cook over medium high heat for about 20-30 minutes stirring constantly until browned to your desire. Be careful not to let the hot roux spatter on you. It will burn and make a blister. I cook my roux to look like dark brown chocolate, but take care, you can burn it if you get it too dark. If you have never made a roux, I would suggest using Kary’s the first time. For the chicken, the easiest and quickest method is to buy a roasted chicken from the the grocery deli. I usually roast my own. The day before you are going to cook your gumbo, take your raw chicken and split it down the back bone using kitchen shears. Season both sides with a low sodium Cajun seasoning or a combination of salt, red pepper, garlic powder, and black pepper. Lay it flat, skin side up, in a baking pan that is deep enough to catch the juices. Roast on 375 degree for about an hour or until the thigh temps at 185. I use a probe thermometer to temp. These can be purchased at any grocery. Debone the chicken when cool enough to handle, pinching the meat into nice bite sized pieces. Store deboned chicken in fridge until the next day. Now, it’s time to make your broth. Follow the directions in my method for making a homemade chicken stock. Since I like a slight smoky taste to my gumbo, I add a smoked turkey leg or wing (available at most groceries) to my stock while it is cooking. Then, you have the turkey meat to add to your gumbo along with the chicken meat. 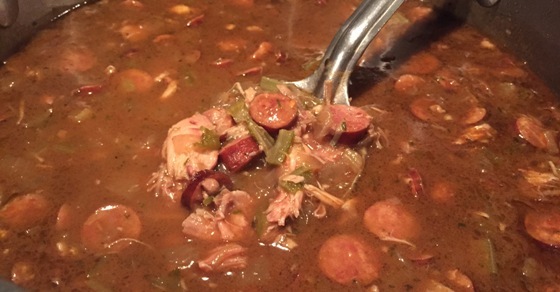 If you don’t want to take two days to cook your gumbo, and you don’t have all day, then I suggest using a deli roasted chicken, canned chicken broth, and skip the turkey leg. If you really want to save some time, use Season Blend Veggies found in the frozen vegetable section of most groceries. The blend contains the perfect ratio of onion, to celery, to bell pepper. Also, opt for Kary’s Roux. Sausage is a key ingredient so don’t scrimp! I like Connecuh Original or Hot and Spicy sausage. These are easy to find in the South, but I have had trouble finding them in groceries in other parts of the country. In these cases, I’ve used a Kielbasa. If you want to save time, slice and cook your sausage in your gumbo. However, this adds extra fat and browning first will add to the flavor. For the browning method, slice the sausage and brown in a skillet. Drain off the fat, squeeze sausage between paper towels to remove as much additional fat as possible. For a really easy clean up method, scatter sliced sausage on a parchment or aluminum foil covered oven pan and brown in a 400 degree oven for about 20 minutes. Do not over brown your sausage. For all you shrimp lovers out there, yes–add some raw, peeled, deveined, tails off, shrimp by all means. You can also add some lump or special white crab meat. No imitation PLEASE! Oh my word!!! Now you’re the MASTER! The traditional way to eat gumbo is over rice. However, in my opinion the average person puts way too much rice in their bowls which weakens the wonderful flavors of the gumbo you have worked so hard to prepare. I personally do not eat my gumbo over rice. I eat my gumbo without rice or spooned over crusty garlic bread. Delicious!! For rice lovers, see my perfect rice recipe that came from an old South Louisiana friend. Just like our recipes, we cook EVERYTHING from scratch! 3 T. (9 cloves) fresh garlic (minced) You can use the minced garlic in a jar if you want to save time. Read the instructions above and decide how much time you want to spend and what time saving tips you want to take in making your gumbo. Heat roux in a 2 gallon heavy stockpot. Add veggies, broth, garlic, bay leaf, and some seasoning to taste. Hold back some seasoning until after you add your meat when you will tweak the whole pot. Simmer until veggies are tender and okra is about to fall apart. Add chicken, turkey leg meat, and sausage and simmer about 20 minutes. Tweak with seasonings one last time. Take care not to over stir or chicken will shred and fall apart. I like my chicken in nice bite size pieces. Serve over hot rice. I personally love gumbo spooned over crusty French bread.